Italian rabbi of the seventeenth century; pupil of R. Ẓebi Hirsch b. Isaac in Cracow. He was rabbi in Venice, and labored as such together with Leon of Modena. 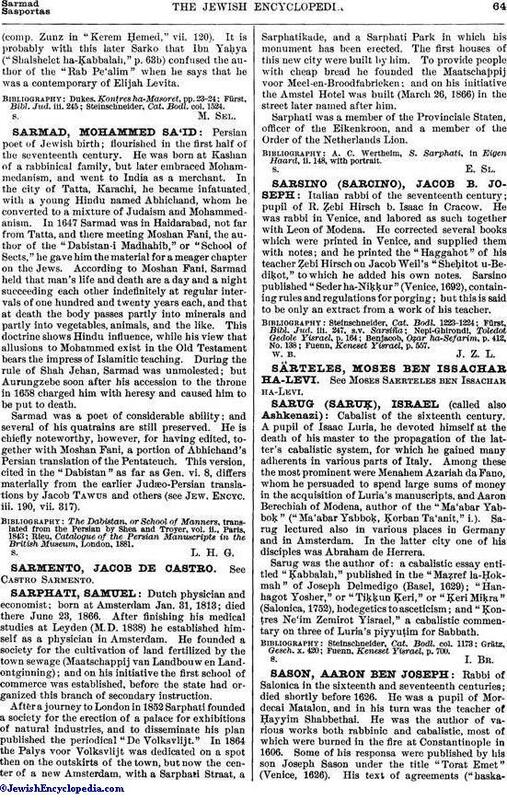 He corrected several books which were printed in Venice, and supplied them with notes; and he printed the "Haggahot" of his teacher Ẓebi Hirsch on Jacob Weil's "Sheḥitot u-Bediḳot," to which he added his own notes. Sarsino published "Seder ha-Niḳḳur" (Venice, 1692), containing rules and regulations for porging; but this is said to be only an extract from a work of his teacher. Fuenn, Keneset Yisrael, p. 557.